Your trip is booked and you’re ready to go — there’s just one problem: what do you do with your cat? Cats are generally really great at spending a few days by themselves as long as they have enough water and food at their disposal. But, flying with a cat…is it do-able? What if you can’t find a cat sitter? Or what if your trip is long-term? Well — why not bring your cat with you? Flying with a cat might seem a bit overwhelming but it’s definitely possible as long as you follow a few steps to make the experience as least traumatizing for your cat as possible. If your cat is great at napping (which most cats are!) then your cat shouldn’t have any problems during a flight. Before you bring your cat along with you on your next airplane ride, take a look at these helpful hints below. They just might help make flying with a cat easier than you ever thought. And keep reading for our most highly recommended cat-friendly airlines. 1.6 Does Your Cat Need A Sedative? Contact the airline you plan on traveling with prior to booking your flight. Speak with an airline agent to confirm that your cat can fly in the cabin with you and stored underneath the seat in front of you. Avoid having your cat fly in the cargo hold if at all possible. Many airlines will allow your to bring you cat in a carrier to stay in the cabin with you — however, most will require a small fee. It’s important to call the airline in advance to make sure you know all the requirements as well as to guarantee a spot on the plan for your feline friend. Airlines will generally have a limit as to how many pets can be on board at one time. Be sure to ask the airlines about the exact dimensions of the underseat space. This way you can buy a proper carrier well in advance — more on this below. Try your best to select a non-stop flight or one with minimal stops. After booking your flight, be sure to get a locator number for your cat — this will be associated with your assigned seat number. 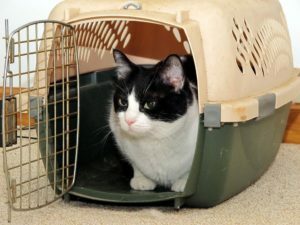 After confirming the dimensions of the size of under-seat space your cat carrier will require — it’s time to start shopping for one that your cat will find most comfortable. It’s worth asking the airline if they have any restrictions or requirements with the types of carriers they allow. 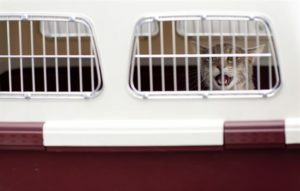 When considering a cat carrier for air travel — a soft-sided carrier might be preferred. These types of carriers have more “give” when being placed underneath the seat in front of you. However, some airlines only allow certain brands of soft-sided carriers — be sure to check beforehand. Once you’ve found the perfect carrier for your trip, it’s time to start “training” your cat. It’s recommended to purchase the carrier far in advance of the trip to implement this training well before the trip. Have the carrier open and available in your house at all times. This will get your cat used to its presence and also create a welcoming tone. Practice going in and out of the carrier — this will be important practice for the upcoming security screening. It may be helpful to practice using a harness during this process as your cat will most likely be wearing one to go through security. Print or create a “live animal” label, and a luggage tag with your contact information, to place somewhere on the outside of the carrier prior to the flight. Chances are the airline will require an up-to-date and valid health certificate. 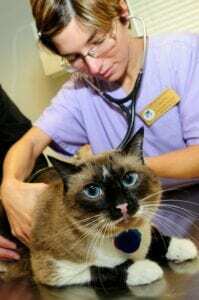 Schedule a visit with your veterinarian within a couple weeks of departure. Be sure to ask for a copy of your cat’s rabies vaccination as well. Your veterinarian will issue a health certificate that lets the airline know your cat is healthy, free of parasites, and current with all vaccinations. Make sure to carry this certificate, and any others, along with you on the day of your flight. It’s possible that your veterinarian may also suggest getting your kitty micro-chipped if they aren’t already. Micro-chipping is a very simple procedure that does not hurt your pet. In the rare event that your cat escapes its carrier or your hands — the microchip could help locate the lost cat. When flying with cat — this procedure should definitely be considered. In the coming days before the big trip make sure your cat gets plenty of exercise and plenty of sleep. The plane ride is going to be a bit anxiety-inducing for your cat so it’s important they are in a good mental state prior to the travel day. Make sure to give them plenty of love and lots of time playing before the flight — use this opportunity to use the carrier as part of “playtime.” It might be a good idea to clip your cat’s nails as well. Flying with a cat is worth every precaution. Here’s where all the practice comes into play! It’s imperative to not feed your cat prior to the flight. When your cat has an empty stomach, it is less likely that they will experience any nausea or vomiting. If you want to carry a bag of their food to have them eat towards the end of the flight, that is fine. Avoid giving your cat any water within an hour of the flight. Line the carrier with some absorbent potty pads (make sure to bring extra!) and have your cat enter the carrier. Hopefully at this point, after some practice, it isn’t a scary place for them. Now it’s time to go to the airport and pass through security — what should you expect? Your cat’s travel carrier will be required to go through the x-ray screening device. Your cat, however, cannot. Place all your belongings on the x-ray belt and remove your cat from it’s carrier for security. Attach a harness to your cat and remove them from the carrier. Hold on to them and walk through the human screening device. Once you have been approved to proceed, safely place your cat back in its carrier and proceed to your gate. Place your cat gently underneath the seat in front of you. Check on them every half an hour or so — it’s best to just let them relax and sleep as much as possible. 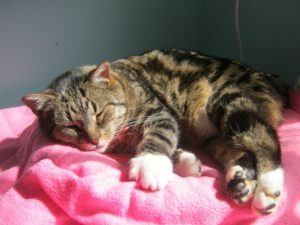 Does Your Cat Need A Sedative? You might think a sedative of some sort would be necessary when flying with a cat — however, the chances of this being a requirement are slim. Most cats will travel quite well and will not require medication. Other cats undergo a tremendous amount of stress during these types of situations. It will be up to you to consult your veterinarian prior to the trip to see if sedatives should be an option for your particular cat. Finding the perfect airline to transport you and your pet can be a bit difficult to decipher. Most airlines do allow cats (and other pets) to fly on their flights. However, which airline you choose may come down to something as simple as preference. Some airlines have higher fees for traveling with your pet but the cost of your ticket may be very affordable. Other airlines might have breed or weight restrictions on pets. Research will be up to you. JetBlue: Ranked very high in overall customer service. In-cabin pet fee is $100 each way. Offers a frequent flyer program for your pet called JetPaws. Southwest Airlines: Lowest pet fee at $95. Only allows small pets. Delta: Ranks high in most on-time arrivals and fewest cancelled flights. Pet travel fee of $125. American Airlines: Recently introduced a first-class flying program for your pet called Cuddle Class. Pet of of $125. Traveling with your pet, specifically your cat, can be stressful. Flying with a cat just takes a bit of prep and some additional knowledge. But don’t fret — proper research and plenty of time to prepare can make your travel day go off without a hitch!